If cookies, chips, and other high-calorie snacks take longer to fall from the vending machine, you may be enticed to get a healthier snack instead, according to a new study funded by the National Institutes of Health. The researchers created experimental vending machines that had a 25-second time delay before high-calorie snack options were released. Consumers were made aware of the delay by signs on the machines and a touchscreen menu with a countdown timer. The delay made some people rethink their snack choices. There was a 2-5 percent increase in the proportion of total healthy snack purchases. 1. According to Japan Vending Machine Manufacturers Association, there is approximately 1 vending machine for every 23 people in Japan. a. Why are vending machines popular in Japan? b. 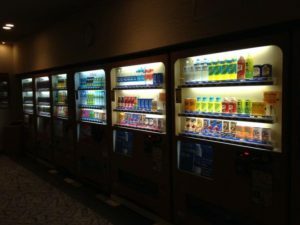 What are some unique products we can buy from vending machines in Japan? c. What healthy products can we buy from vending machines in your area? 2. Which snacks would you consider healthy and where can you buy them? 3. Do you think delayed vending machines encourage healthier snack choice? What are better ways to make people eat healthy food choices?